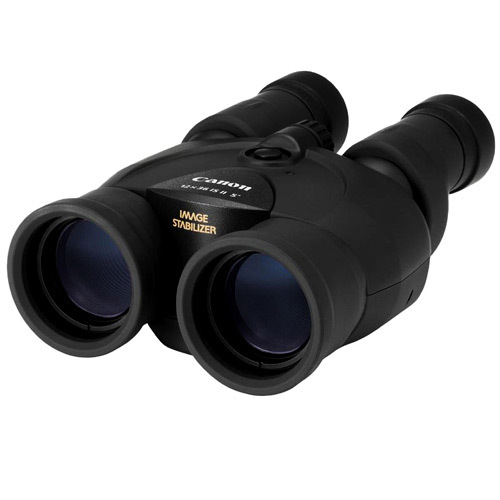 The Canon 12x36 IS III portable binoculars are made with Image Stabilization is compact and lightweight making it the ideal tool for the trailblazing traveler, avid bird watcher or the sports fanatic. The Super Spectra coating included in Canon’s EF lens range will deliver vivid imagery and eliminate unwanted internal reflections that may cause flareFLAREOccurs when a point light source such as the sun or an artificial light (that is brighter than the rest of the scene), hits the front element of a lens resulting in a lack of contrast, haze, or unwanted semi-transparent objects being present in the image. You can avoid lens flare with a lenshood or filters, however, the effect is also useful for bringing artistic elements into an image, such as sun rays peaking out from behind a rock formation. and ghosting. By getting you 12x closer to distant subjects wherever you go with precision Canon optics for high resolution and accurate colour rendition, you will see everything crisp and clearly. Canon’s 12x36 IS III has a super steady Image Stabilizer button and smooth focusing adjustment ring that will quickly and accurately counteract shake and movement, even while panning. The low gloss front will help avoid disturbing birds and other wildlife while its well-balanced rubberised design has a comfortable grip for high-quality performance, durability, and comfort. Thanks to field flattening optics, Porro II prism design and comfortable 14.5mm eye relief for the spectacle wearer; you can now take pleasure in a beautiful field of view with a clear and low distortion view right up to the edges of the binoculars.